I have got your contact details through Iskander Walen. I have something you can hopefully help me with. 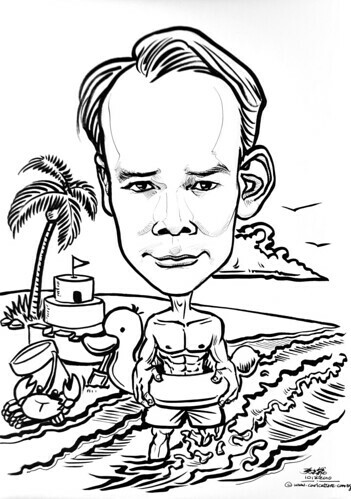 This weekend will have a party with some friends on the beach and as kind of joke I like to make a caricature of one of my friends and give that to all the children to colour it in and the most beautiful colour plate will then win of course a small price. So I need a caricature which I can use as colour plate. Can you help me with this? I have attached 2 pictures of the same person. I would suggest to place him in a beach environment with a lot of extra elements (because otherwise have the children nothing to colour). You can make it as absurd as you like as long people will recognize the real person. I need your brilliant creature by tomorrow, would that work?" A pretty low resolution reference photo provided.